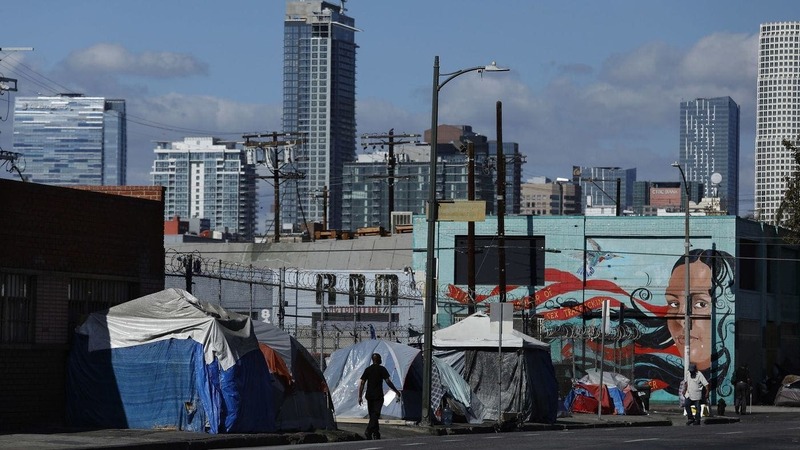 The number of people living on the streets in Los Angeles and San Diego, two epicenters of the crisis, fell this year, suggesting those cities’ efforts to combat the problem could be starting to pay off. In Los Angeles, the count fell by 3% after a sharp increase the year before. Peter Lynn, executive director of the Los Angeles Homeless Services Authority, said that can be credited to six months of stepped-up homeless services after Los Angeles County voters raised taxes to help in 2017. Later that year, Los Angeles city voters approved a bond issue to provide more affordable housing — a factor Lynn said will start showing up in future counts. More than 37,000 of the unsheltered were in the Los Angeles area this year, down 2% from 2017. Nationwide, the overall increase this year was driven by a 2% rise in the unsheltered homeless population — those living in vehicles, tents and on the streets — along with 4,000 people in emergency shelters after hurricanes, wildfires and other disasters, according to HUD. The numbers of homeless veterans and families continued their long-term declines. At a time when rents are rising faster than wages — especially for lower-income people — an essentially stagnant count is not a bad sign, said Steve Berg, vice president for programs and policy at the National Alliance to End Homelessness. 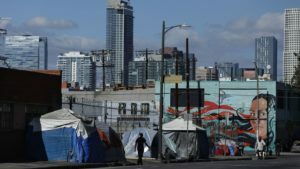 The homelessness data picture is incomplete because several West Coast areas with large populations, including San Francisco, Orange County and Portland, Ore., did not conduct new counts of unsheltered homeless populations this year. Those places will do fresh surveys in early 2019. The City Council in May passed a $48-million tax on businesses to raise money for affordable housing. But under pressure from Amazon, Starbucks and other companies, it repealed it the next month. Another place in the West with a rising number was the Phoenix area, where the total count this year was nearly 6,300, up 12% from the previous year. About two-fifths of people without homes there are in shelters. The region’s status as the fastest-growing county in the U.S., with 200 people a day moving in, is a factor in the rising homeless number, said Anne Scott, a human services planner who coordinates the count for the Maricopa Assn. of Governments.